Thanks for the Awards, 2017! 2017 is drawing to a close, and as we’ve said before, it’s been a big year. We’d like to take a moment to highlight a few rewards we were nominated for and to thank those who supported us. Giving us a spotlight bolstered our spirits and made us feel like we were producing games that are worthwhile. We want to give a big shout out to Deloitte for having us on their list of Canada’s 50 Fastest Growing Companies. We landed in the 46th slot, and we are humbled by this. These awards honour some truly remarkable businesses, and it’s a privilege to be in their company. Chances are, we will continue to grow in 2018. With a little luck, and a lot of hard work, we hope to see ourselves on this list in the coming years. 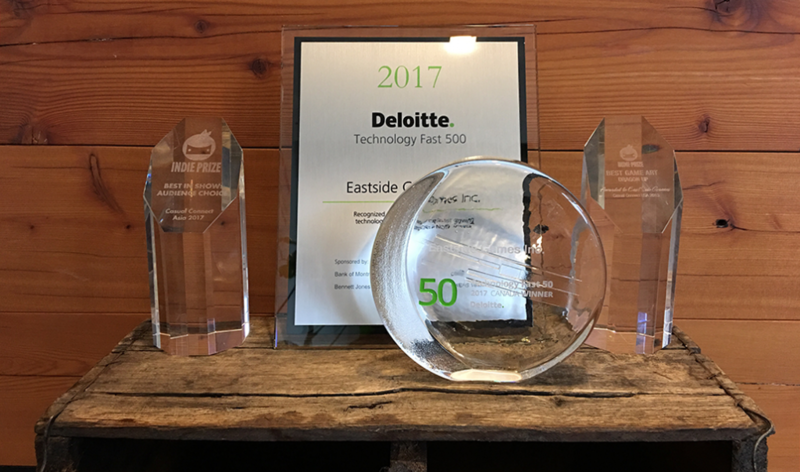 In the same vein as the Technology Fast 50™ Award, we also placed #265 in Deloitte’s North America’s Technology Fast 500™. While this list is similar to the former, it’s amazing to zoom out and see us in the ranks of these companies. We also received the Audience Choice award in the Indie Prize Singapore event this year. Announced at Casual Connect Asia, we were blown away and overjoyed. Casual Connect hosts one of the most prestigious global independent games showcases out there. Garnering over 100 speakers and putting the spotlight on new and interesting products, we’ve always been keen to go to the next one. We want to thank everyone who voted (even if it wasn’t for us). The BC Export Awards also gave us some love by placing us as a finalist in their Digital Media and Entertainment category. The BC Export awards totes the title of the most prestigious awards in British Columbia. These Awards have recognized BCs biggest exporters, and we are proud to be among them. We’ve always prided ourselves on the accessibility of our titles. Being able to see people outside of BC experience our weird little games brings us joy. BC is our home, and being able to represent it as a studio is an honour. We don’t just export lumber and good beer, ya know. So in short, 2017 was pretty dang good to us. Thanks to everyone else who lent us their support and kindness. We hope to see you all in 2018.